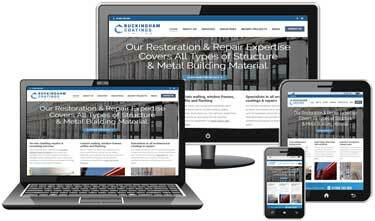 Buckingham Coatings is pleased to announce the launch of our new and improved website. With the updates we’ve been making over the last three months, our website has been revamped to deliver a twist on the original look and feel by adding some new features, additional content and a much more intuitive user experience overall. As one of the UK’s leading remedial cladding repair, maintenance and restoration specialists, our homepage has been designed to tell visitors the story of who we are in pictures. Whilst, the central three columns display exactly what we do to transform a building’s exterior, the banner carousel at the top of the page gives a flavour of some of the prestigious companies we’re proud to work with. About us is a new page to tell you more about our company and the accreditations behind our health and safety quality assured service. Perhaps the biggest change to our website is to the new hubs we’ve created to hold our Services portfolio and the Industries we serve. Both hubs offer a central space for users to browse content based on the category of work; making the user experience more personal to the type of content you want to explore. Regular visitors to our website will also see that our News area has been updated. We now have regular content posted each month to promote our latest developments from in and around the company. We recommend users keep checking back here to hear more about our promotional offers and top tips emerging from industry insights each month. With its fresh new look and feel, our revamped site affords users the opportunity to navigate through our extensive service offering more easily. The site is accessible to all mobile devices, delivering a fully responsive experience, that gives users a seamless transition from desktop to mobile browsing. The site also intelligently pulls content from the blog space and Recent Project pages for users to access our news and customer case studies quickly and easily. “We’re excited about the revamp to our website and hope that our customers will find accessing information about our services much easier now. We love the new look and feel, particularly the new content hubs for our Services and Recent Projects. Our website is an important part of our business, so as we strive to keep improving every aspect of our service. I’m delighted to have this platform to demonstrate our commitment to excellence with our customers, partners and colleagues. The Buckingham Coatings website will be updated with new content on a regular basis, including information on new services and the latest work in customer case studies. Buckingham Coatings has built a strong reputation for being specialists in repair and recoating of cladding, roofing, curtain walling and architectural fixtures across the UK and Europe since 2016. The company’s restoration and repair expertise covers all types of structure and metal building materials including pre-finished steel cladding and anodized aluminium. Priding itself on delivering a professional service with a consistent emphasis on quality, safety and innovation, their expertise allows a flexible and collaborative approach to works. Serving a wide range of industry sectors, Buckingham Coatings works with some of the biggest and most recognisable brands in the world including: Jaguar Land Rover, Unilever, Porsche, Starbucks, McDonalds, KFC, Adidas and a number of Premier League football clubs including Tottenham Hotspur Football Club, Watford Football Club and West Ham United Football Club. PreviousPrevious post:New Year. New Cladding Refurbishment.